Yayoi period is one of periodizations in the Japanese Archipelago excluding Hokkaido and Okinawa Islands. The Yayoi period follows the Jomon period and precedes the Kofun period (tumulus period). It is the period approximately between the middle of the 10th century B. C. (though there are some objections to this date) to the middle of the 3rd century. 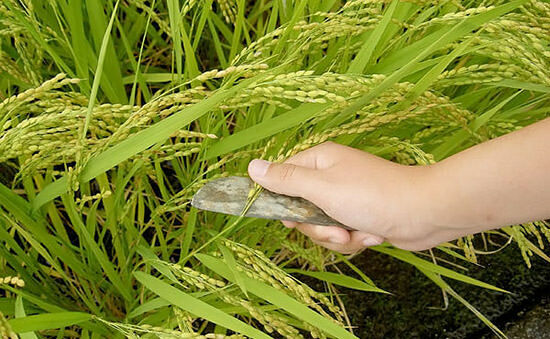 In specific terms, it is the period when rice-paddy cultivation started in Japan by introduction rice cropping techniques. Around the fifth century B. C. , life style of rice-paddy cultivation was introduced from the continent to northern Kyushu, and it spread to Kyushu, Shikoku, and Honshu (the main island of Japan). Early paddy field remains including continental ground stoneware and carbonized rice were concentrated and discovered in the northern Kyushu region, such as the Itazuke site located at Hakata Ward, Fukuoka City, Nabatake site located at Karatsu City, Saga Prefecture, Magarita site located at Fukuoka Prefecture and Notame site located at Fukuoka Prefecture. It was the beginning of the Yayoi period. In recent years, some evidence shows that the temperate Japonica-rice, a rice-paddy plant, was introduced by the end of Jomon period. Moreover, there is a possibility of the start of the Yayoi period going back to at least the 10th century B. C. by recent radiocarbon dating. Rice-paddy cultivation that was introduced around the end of 10th century B. C. and took 300 to 400 years to spread to the Southern Kinki region and 700 to 800 years to spread to the Southern Kanto region. In 1981, remains of large-scale-well-ordered paddy field sections from the middle of the Yayoi period were found in the Tareyanagi site located in Inakadate Village, Minamitsugaru-gun, Aomori Prefecture. Rice-paddy cultivation had spread to the Tohoku region during the early Yayoi period and a small remains of a rice-paddy field was discovered in the Sunazawa site located in Hirosaki City, Aomori Prefecture, and it had spread to Matsumoto-daira Basin in Chuokochi (Central Highlands) and the Shinano-gawa River area during the middle of the Yayoi period. It took 200 years to spread to the highlands in the Chubu region. One of the reasons for taking such a long time was that photosensitive rice does not grow in the Chubu highland where hours of sunlight are short. Rice-paddy cultivation quickly spread across the Japanese Archipelago. People who created paddy fields made Yayoi earthware, in many cases lived in pit-type dwellings and built a dug-standing pillar building and a storage pit. Settlements had clear divisions between the living area and graves, and the village surrounded by a moat were excavated around the area of living. Stone tools were used for implements, agriculture cultivation tool and cookware, but gradually shifted to ironware from stoneware. Bronze ware was originally used as a weapon and was later used as a religious service accessories. Also wooden tools were often used as farming equipment and dinning utensils. 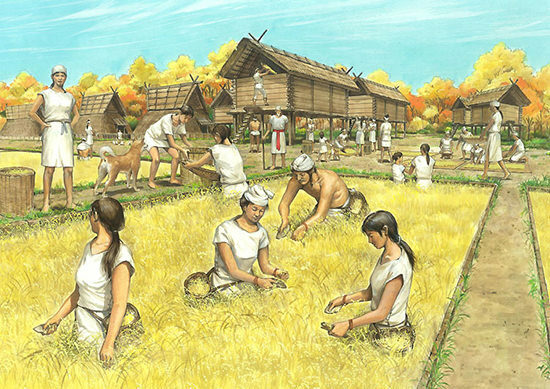 During the Yayoi period, adaptation of farming, especially rice-paddy cultivation, enabled the storage of grain. Therefore, production and storage of surplus crops increased and it changed to wealth, which created the haves and the have-nots leading to the disparity between rich and poor and a superior-inferior relationship. Also groups became large sized by the introduction of rice-paddy cultivation techniques, as the cultivation and management of agricultural water required a large labor force. It is believed that battles between large groups over wealth, cultivated land, and water supply occurred. As a result of the integration of groups and the progression of a superior-inferior relationship during battles, small provinces were created in various regions. During the middle of the first century, Wa no na no kokuo in (the oldest known seal in Japan) was sent to Japan from the Later Han Dynasty and in middle of third century, the queen of Yamatai-Koku Kingdom (Himiko) paid tribute to Wei dynasty (Three States Period) and presented with golden seal which implies the king of Wa (Japan). The continent had called Japan &apos;Wa&apos; from this period onwards. The statements below refer to Kyushu, Shikoku, and Honshu until annexation. See History of Okinawa Prefecture, Amami Islands, and Sakishima Islands for the history of the Nansei Islands. In the second to third century, around the end of the Yayoi period, the climate was slightly cool. Also the third century was a period of regression when the seawater receded and sand carried by rivers was deposited over the clay layer at the bottom of dried up ponds and lakes. There are various theories about the start of the Yayoi period. Originally the Yayoi period meant the period that used Yayoi earthenware. However the fact that Yayoi earthenware required rice or rice-paddy cultivation techniques gradually came to be known. Then the point of view that the Yayoi period was an agrarian society based on food production by rice-paddy cultivation and should be distinguished from previous periods, Jomon period (a hunting and gathering society), became mainstream. While such arguments were going on, ancient structural remnants of paddy fields at the Yusu earthenware stage was discovered at the Itazuke site located in Fukuoka City. The Yusu earthenware stage was originally considered the latter half of the last Jomon period, but an opinion stating that the stage was an agrarian society was submitted, as the period already adapted rice-paddy cultivation techniques. After that, the essential subject of the difference between the Jomon and Yayoi periods, was argued between researchers and various indicators were proposed, including forms of settlement, forms of graves, presence or absence of paddy fields and changes in artifacts such as earthenware and stoneware. 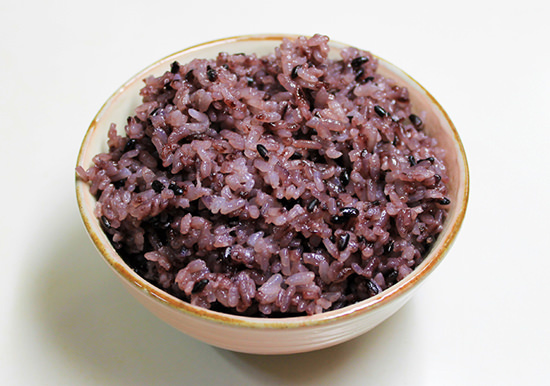 Presently the Yayoi period is roughly classified as a stage after the stable adaptation of rice-paddy cultivation techniques. Therefore, a society with rice-paddy cultivation techniques (at least in northern Kyushu) existed before the first half of the early Yayoi period (Shown in a form of earthenware called Kizamimetottaimon earthenware such as Yusu earthenware. )Traditionally this stage was classified as the latter half of the last of Jomon period, but it is now becoming to be called the earlier Yayoi period. Research on grain impressions on earthware progressed and it is known that rice-cropping techniques were introduced to Japan Archipelago by the end of the Jomon period at the latest. Also the possibility that the adaptation of rice-paddy cultivation in parts of northern Kyushu that go back to the first half of the last of Jomon period is indicated, but clear evidence of ancient structural remnants have not yet been discovered and is still speculation. The Yayoi period was originally divided to three periods; the early period, middle period, and the end period, but recently the Yayoi period is divided to four periods; the earlier period, early period, middle period, and end period, based on the above stated research. There is also a way to divide the Yayoi period into five (or six) periods, which are I (pre I) to V, outside the northern Kyushu region. Each period is equivalent to (Earlier period to pre I period) early period to I period, middle period to II to IV periods and end period to the V period. (The Earlier period started from the middle of fifth century B. C. ) early period started from the third century B. C. , middle period started from the first century B. C. , end period started from the first century and lasted until the middle of third century. Recently, there is a theory insisting on moving back to the start date of the Yayoi period dramatically, based upon radioactive carbon dating research results shown by a research group from the National Museum of Japanese History. According to the theory, the start of the earlier period is moved back approximately 600 years and starts around 1000 B. C. , the start of the early period is moved back approximately 500 years and starts around 800 B. C. , the start of the middle period is moved back approximately 200 years and starts around 400 B. C. , the start of the end period is at 50 B. C. and the transition to the Kofun period is in the middle of the third century, which is conventional. In contrast to the previous period (Jomon period), it is believed that battles between settlements and regions occurred frequently during the Yayoi period. Moat settlements that have a moat around the settlement and upland settlements that were located at top of the mountain more than 100m in height are said to be evidence of battles between settlements. Weapon wounds on the recovered human bones (a human bone with trauma) also supported the evidence of war. However there are many objections to this one-sided point of view and it has not yet become an established theory. A human bone with 15 Sekizoku (a flint arrowhead) at chest to waist area was excavated from an early Yayoi period grave. However, because of the unnaturalness of arrowheads being concentrated in a specific area, new recent interpretations are arising such as; arrowheads were buried as burial goods, or a person was shot with arrows as a sacrifice (sacrificial offering) in some kind of ritual. 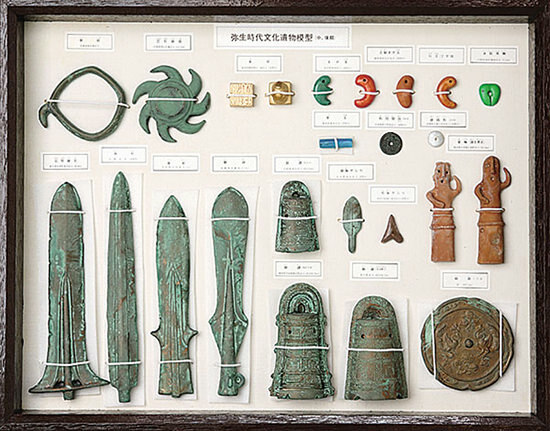 Moreover, the tip of bronze swords, doka (bronze halberds for ritual), stone swords, and stone halberds are often excavated from a coffin of the early to the middle Yayoi period in northern Kyushu. Up to now, these examples are thought of as remains of a weapon breaking off when stabbing the human body. However there is a counter argument that there could be a custom to bury tip of weapons as burial goods inside the coffin and the argument has not yet been settled. Moreover, the fact that a number of kamekan (earthenware jar-coffin) for males excavated at the Yoshinogari site at Saga Prefecture and Kuma/Nishioda site at Chikushi City, Fukuoka Prefecture is double the number of female&apos;s, which is interpreted as the males had more occasion to join in battle. Also in some cases, kamekan with whole body except the head part were excavated, and these were interpreted as an enemy taking the victim&apos;s head from the battle field and the victim&apos;s body was taken back to the settlement for burial, however it is not proven if they really were victims of a battle, or if it was the result of some ritual. Among these human bones with trauma, there are human bones with a clear sign of weapon trauma and they are treated as the evidence of the existence of battles. For example, a human bone with fatal wound across the forehead to right eye and broken right wrist, which is a typical defensive wound that happens when defending from attack, was excavated, and it is very likely that the person was wounded by fighting. Also there are several cases with tip of weapons impacted human bones in northern Kyushu, and they are clearly human bones showing weapon trauma. There are these types of human bones with trauma from the Jomon period, however the number of cases clearly increased during the Yayoi period and definitely the battles were more frequent compared to the Jomon period. Among the above described evidence of battles, cases with a tip of a weapon in the coffin, human bones without a head and bone trauma are often found from the latter half of the early period to the first half of middle period in the northern Kyushu region, especially in regions around Ogori City, Fukuoka Prefecture. Many settlements in western Japan are said to have been moved up hill, that lacked large cultivation areas, at once in the latter half of early period to the first half of middle period in Yayoi period. It is suspected that many settlements sought more cultivation areas in each region, due to the rapid increase in population of the Yayoi group. This expansion in cultivation areas caused many battles over land and water in various regions, especially the number of human bones with trauma found in northern Kyushu provide the evidence of the frequent occurrence of battles. Excavation of human bones with trauma and tips of weapons in the coffin decreased on and after the latter half of middle period. A moat settlement was believed to be a defense against battles between groups. However, recently not many researchers consider moat settlements as defensive and directly related with wars, for several reasons such as; the emergence of moat settlement goes back to earlier Yayoi period when there was very little evidence of battles (Etsuji site and Nakai sites in Fukuoka Prefecture), less moat settlements are excavated from northern Kyushu in the latter half of early period to first half of middle period, especially beginning of middle period when frequent wars were thought to have occurred from the evidence of human bones with trauma, and banks were created outside the moat in some cases using soil dug up to make the moat, which gives an advantage to the enemy (Enemy can use the bank as a shield against arrows and also can attack from the top of a bank. )There are other opinions such as large scale public work, such as digging a moat, was practiced to tighten the union of the community, or to create and increase group consciousness by enclosing the group. However a moat was often dug in an upland settlement during the end of the Yayoi period and Sakamogi (fence made of thorny or steeple branches to prevent entry of an enemy) were placed at the moat in some cases (Asahi site at Aichi Prefecture). 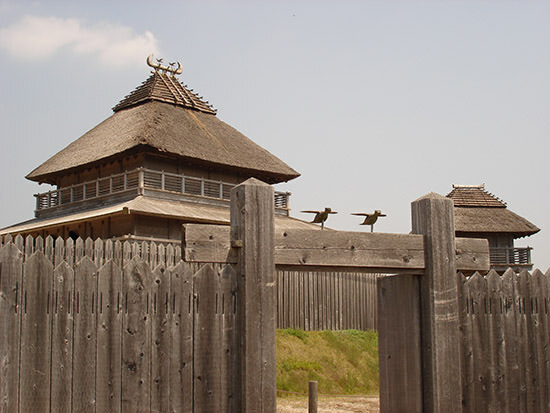 These indicate that some moats were equipped with defending facilities and an opinion insisting that the function of the moat should be considered depending upon the region and period is very persuasive. On the other hand, upland settlements have been long considered a type of defensive settlement. Upland settlements are often found along the Setouchi seacoast to Osaka Bay in the latter to end of the middle of the Yayoi period (the latter to the end of IV period) and middle to the end of the end period (the middle to the end of the V period), and they are settlements located at very high ground compared to general settlement in the Yayoi period (50 to 300 meters high compared to flatland). They are distributed widely across northern Kyushu to Hokuriku, Chubu and Tokai regions. The Kinai IV period was considered to parallel the first half of the end period in northern Kyushu and the Kinai V period was considered to parallel the latter half of the end period, and identified as 50 to 250 A. D. in actual chronology until 1970s. History books describe that the Wakoku War had occurred around the end of the second century and it is around the end of the Kinai IV period to the early V period in view of the period. Therefore the Wakoku War was considered as a reason for the prospering of the upland settlements. 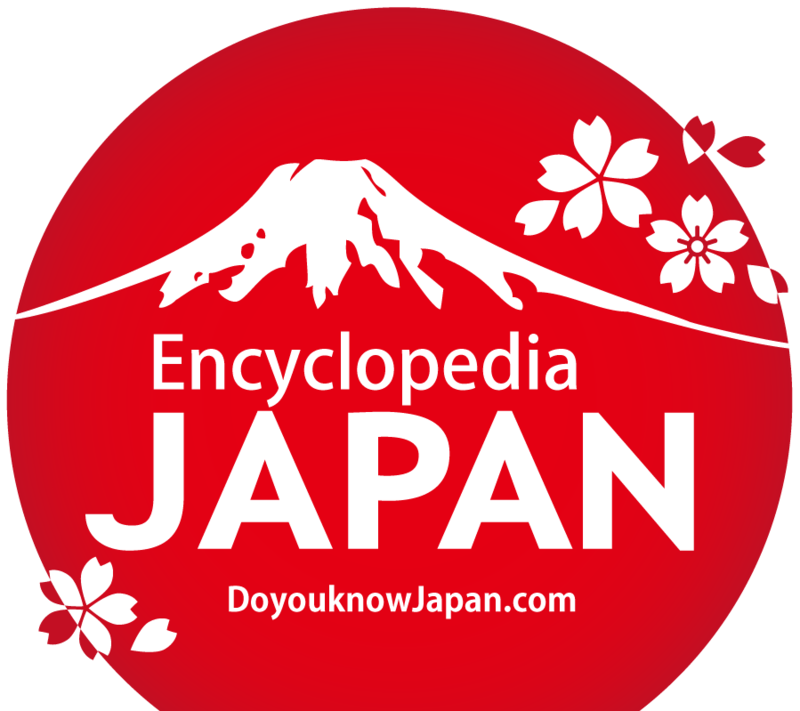 However the parallel relationship of the Kinai and Kyushu periods were corrected. According to a correction, the Wakoku War comes under the latter to end of the Kinai V period, which has no periodical consistency with upland settlements, and theory stating upland settlements were not related to the Wakoku War, became the mainstream. Therefore, as for upland settlements in the Kinai IV period, there is some opinion insisting that there were wars not described in history books during the period, as well as an opinion insisting that there is no need to assume wars for its background. The argument has not yet seen a settlement, especially the latter argues that living in a location with a wide view enabled the monitoring of watch marine traffic, or it was a group that mainly lived off dry field farming and they did not need to live on a low-lying ground, which is profitable for rice-paddy cultivation. On the other hand, upland settlements in the Kinki region in the latter half of the end period (Kannonjiyama site at Izumi City, Osaka Prefecture and Kosobe site at Takatsuki City, Osaka Prefecture are mountain castle with moat) are considered to hold some relationship to the Wakoku War, as its prospered period in both northern Kyushu and Kinai matches to the period of Wakoku War described in history books, after the correction of the period described earlier. Gishiwajinden (literally, an &apos;Account of the Wa&apos; in "The History of the Wei Dynasty") describes that there were conflicts between various districts before Himiko ruled the Yamatai-Koku kingdom. Dongyi zhuan (the record of encounters with the eastern barbarians) in Gokanjo (Historical records of the Later Han Dynasty) describes Wakoku (Japan) was in a troubled state (Wakoku War) during the time of the Emperor Ling (Han dynasty) to the Emperor Huan (the Han dynasty). As a result of recent chronological corrections to the Yayoi IV/V period in Kinai, the description is now considered to fall under the latter to the end of the Yayoi period (latter V period to VI period). These are many upland settlements and moat settlements are found around Kinai to northern Kyushu, Setouchi, Sanin, Hokuriku, Tokai region, and east in this period, and it is an established theory that these are evidence for the Wakoku War. However, not many researchers insist on the occurrence of actual battles as there was little development in weapons compared to the previous generation, especially very few weapons for close combat are found apart from burial goods and few human bones with trauma were excavated. No clear picture about the Wakoku War has been unraveled. For Yamatai-Koku kingdom in Kinai theory, there is no archeological material evidence to show that northern Kyushu powers migrated to Yamato. Recently the point of view is the battle occurred because of the Kinai power trying to reorganize a logistics system, originally taking initiative of the northern Kyushu power who took the lead in acquisition and nation-wide distribution of raw materials including iron and shipped goods from the continent. For the Yamatai-Koku kingdom in Kyushu theory, on the other hand, the amount of ironware excavated from the Setouchi region even after the middle of the end of the Yayoi period was very limited when compared to northern Kyushu, and the level of ironware manufacturing technique was very low compared to northern Kyushu. Cause of the Wakoku War was related to description of Seisen in the Kojiki (The Records of Ancient Matters) and it is said that the northern Kyushu power moved to Yamato, where they built Yamato Chotei (the Imperial Court). It is thought that later in the period, large settlements subdued smaller settlements and the chief and upper ranks started to seize power in the settlement. The chief and upper ranks were buried in a grave mound in the burial system of the Yayoi period. This implies the emergence of class difference. The burial system became notably different between regions at the end of the Yayoi period. The square-shaped low funkyubo (grave mound) was created around the Kinki region, the burial system of the Yayoi period was practiced in Sanin (Izumo) to Hokuriku, and a large-scale grave mound was created in the Setouchi region. Among the Setouchi region, areas around Okayama Prefecture and Western Hiroshima Prefecture called Kibi holds grave mounds of the largest scale from the end of Yayoi period, Tatetsuki Grave Mound (80 m at longest point) in Kurashiki City, Okayama Prefecture. Many tokushu-kidai (ceremonial vessels stand) shaped earthwares and tokushu tsubo (ceremonial jar) shaped earthenware were used in the burial ritual of the chief in this region. These earthenware emerged in the Kibi region and spread to Mimasaka Province, Bizen Province, Bicchu Province and Bingo Province, where the earthenware matured mainly in Hirano in southern Bicchu. Characteristically the earthenware are not used in surrounding area of the region. Funkyubo in Sanin is presumed to have emerged in Miyoshi in Chugoku Sanchi (Chugoku Range) and yosumi tosshutsugata funkyubo (square grave mounds with four corners protruding outward) (approximately 45 m x 35 m in large size), appeared in the Izumo region. These used construction equivalent to that seen in the Kofun period later and it spread to the Izumo region in Sanin to Noto Peninsula in Hokuriku. Tokushu-kidai (ceremonial vessel stand) shaped earthenware and tokushu tsubo (ceremonial jar) shaped earthenware were excavated from a concentrated distribution center of Yasugi Grave and Nishidani Grave Mounds, which indicate Izumo and the Kibi region formed an alliance. These characteristics of the grave mound came together and led to the Kofun (tumulus) (such as large keyhole-shaped tomb mound) in a later period. Regional powers in the Yayoi period can be divided into powers of northern Kyushu, Kibi, Sanin, Kinki, Sanen (Tokai), and Kanto. It is believed that smaller groups combined to form one power as period went forward. Period forwarded with battles over commerce between regions as well as battles over acquisition of cultivation land and iron for farming equipment, for development of rice-paddy cultivation. In the Kinki region, moat settlement emerged at the end of the early Yayoi period and spread on and after the middle period. Tools used in the Yayoi period can be divided into materials, such as; stoneware, woodenware, bronze-ware, ironware, and earthenware. There were two types of stoneware; chipped stone tools passed down from the Jomon culture and ground stoneware (continental ground stoneware) introduced from the Mumun pottery culture on the Korean Peninsula. Chipped stone tools were used as hunting tools and sharp-edged tools such as Sekizoku (a flint arrowhead) and scraper. 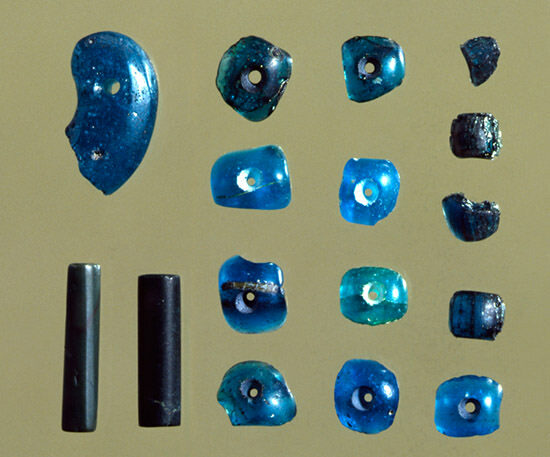 Sanukite, Anzangan rock (andesite) and kokuyoseki (obsidian) were often used as material, and it was manufactured with a method passed down from Jomon period. On the other hand, there was stoneware called continental ground stoneware that came into Japan with introduction of rice-paddy cultivation, such as tools, including Hamaguribamasei stone axe and Eguriirikataba, stone axe, and farming equipment, including ishi-bocho (a stone implement, sickle) and stone stickle. These were new types of tools adapted in the Yayoi period and they used tools for cultivation and harvest, as rice-paddy cultivation techniques spread. Bronze-ware was introduced from the continent to northern Kyushu. 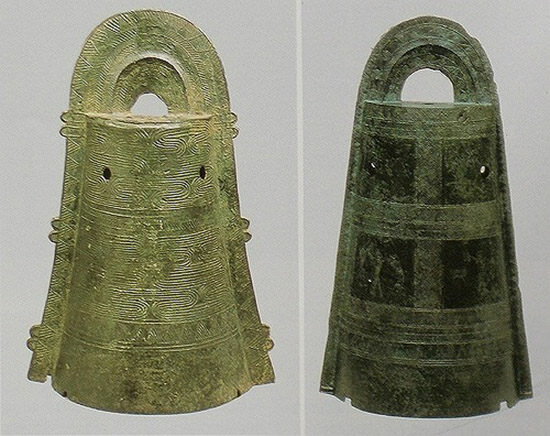 Weapon type bronze ware such as bronze halberd, doka (bronze halberd for rituals) and bronze swords are well known in the northern Kyushu region, and dotaku (a bell-shaped bronze vessel) is known from the Kinai region. Bronze halberd, doka (bronze halberd for rituals), and bronze swords distributed mainly in northern Kyushu, Sanin and the Shikoku region were introduced at the end of early period and manufacturing started right after that. On the other hand, although dotaku is thought to have been introduced from the Korean Peninsula, there was a difference in forms of introduced and manufactured products, and the process of manufacturing in Japan Archipelago is not known. Weapon type bronze ware bronze swords and bronze halberds were a dignity symbol of the owner at the time of emergence, and it is possible that they were used as actual weapons, as its edge was sharpened. Weapon type bronze ware at that time was usually buried as burial goods, which indicate that they were used as the property of the individual. In and after the first half of the middle of the Yayoi period, manufactured weapon type bronze ware such as bronze swords, doka (bronze halberd for ritual) and bronze halberds gradually increased in thickness. On the other hand, dotaku is believed to be a tool for rituals from the time of emergence. However, dotaku became larger and part for hanging was lost as period went forward, therefore it became an object for viewing whereas originally it was a bell with metal parts hung inside for ringing. Bronze mirrors were also introduced at the end of the early Yayoi period and the manufacture in the Japan Archipelago started on and after the middle period. They were buried as a burial good and were also intentionally divided (hakyo - broken mirror) for ritual use. In these manners, most of large bronze ware were used for rituals, except for the time of emergence. There are very few, but some smaller bronze ware were also excavated, such as the tip of a spade used as farming equipment, a Japanese-style plane with long handle as a tool, and an arrowhead as smaller weapon. Apart from a few examples in the very initial stage (few examples of bronze ware manufactured by grinding weapon type bronze ware imported from Korean Peninsula), bronze ware was manufactured by pouring metal into a mold. Many of the molds for bronze ware in its time of emergence, around the end of the early Yayoi period to the first half of the middle Yayoi period, were found mainly in south west part of the Saga plain, around Saga City, and Ogi City, Saga Prefecture. By the latter half of middle period, bronze ware was intensively manufactured in Nakai and Hie sites at Fukuoka City, Fukuoka Prefecture and in Suku sites in Kasuga City. Most weapon type bronze ware were intensively manufactured in these sites, except for the flat bronze sword. On the other hand, dotaku was manufactured in the Kinki region. However sites with concentrated evidence of bronze ware manufacturing, such as those in northern Kyushu, have not yet been found and its manufacturing and distribution system remain unsolved. Ironware emerged in the earlier Yayoi period and it became widespread around northern Kyushu mainly as tools, by the first half of middle of Yayoi period. They spread across western Japan and were adapted as weapons and farming equipment on and after the end of the Yayoi period. Ironware was mainly used for sharp-edged tools, especially implements and farming equipment (harvesting equipment) because of its durability and sharpness of edge. Smaller tools, manufactured by grinding a fragment of forged iron axe, were in use at the time of its emergence, but Japan made an iron axe called Fukurojo-Teppu (literally &apos;bag-shaped iron axe,&apos; hollow structured iron axe) emerged in northern Kyushu by the first half of middle period and it gradually spread around western Japan. In addition, a short sword (Tosu - small knife) and a chisel shaped tool are known. However ironware during this period were made from iron imported from the peninsula and iron making in Japan Archipelago is said have started after the end of the Kofun period. Ironware manufacturing by forging had started by the first half of the middle of the Yayoi period in northern Kyushu, especially in surrounding area of Fukuoka City. On the other hand, ironware manufacturing by cold chisel cutting was common in surrounding area of Yame City, also in northern Kyushu, even at the end of the Yayoi period. Moreover, although ironware manufacturing by forging was introduced to the Setouchi region by the end of the Yayoi period, technology was clearly lower than that of northern Kyushu and ironware manufacturing by cold chisel cutting was practiced in general. A large amount of ironware from the end of the Yayoi period were excavated from sites along the coastal areas of the Genkai-nada Sea, but very little were excavated from sites along the coastal areas of the Seto Inland Sea and Kinki region. It is suspected that the coastal area of the Genkai-nada Sea monopolized the route of iron acquisition. Therefore, a war may have broken out over the control of the iron acquisition route, but it is not archaeologically proved yet. Assuming that there was a war, the formation of a wide area political alliance, such as the Yamatai-Koku kingdom alliance, centering on powers of Yamato in Kinki region is also assumed. For earthenware, bisque (fired pottery) earthenware, which was fired in low temperature oxidative flames, called Yayoi earthenware was used. Yayoi earthenware is often described as less decorative compared to Jomon earthenware. In actual fact, only earthenware in the early period and earthenware from during and after the middle period in western Japan, especially in northern Kyushu, is less decorative, but earthenware from other regions and periods often have various decorations. 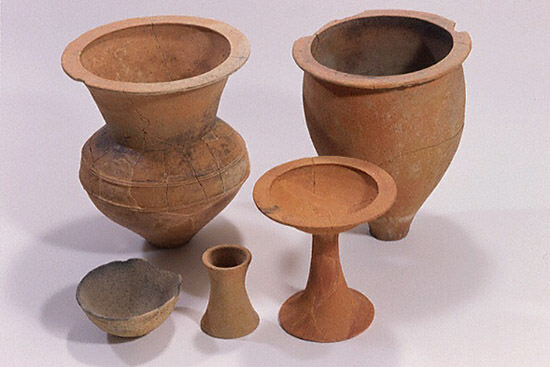 For types of wares, there were mainly jars, pots and a small one-legged tray for one person, especially the pot was not general ware during the Jomon period and it is believed that pots became widespread as storage container, as rice became the main food supply. Earthenware was manufactured in each settlement and it is vaguely believed that the material was self-sufficient in each settlement, but there was hardly any case of ancient structural remnants for earthenware manufacturing found. Recently earthenware of firing failure and earthware with a cracked surface from high temperature are being studied and the possibility of intensive earthenware manufacturing in large-scale settlements were raised. From the fact that the form of earthenware strongly shows regionality, earthenware manufactured on local land and earthenware suspected to have been brought in from other regions were compared and there is a possibility of the movement of larger amounts of earthenware than previously assumed. Woodenware was used as dinning ware and as cultivation tools. Although there are many excellent pieces of work in dinning utensils, which are lacquered and have fine decorations, it is rare for woodenware to be excavated in good condition as they easily rot, and the details are still not known. There are several examples of settlements in the Yayoi period and common examples of ancient structural remnants are; tateanajukyo (a pit dwelling house) as a dwelling, dug-standing pillar building and storage pit for storage facility, doko (a pit) (non-uniform shaped hole/pit) for various purposes such as garbage pit and firing of earthenware, a ditch surrounding settlement and section in the settlement (a moat and a sectional ditch). People in the Yayoi period used tateanajukyo (a pit dwelling house) for a dwelling. Round and a square shapes are popular for ground shapes, and a rectangle and a square with round edges follow after that but they show differences in each region. A dwelling with square ground shape that carries on the tradition from last period of the Jomon period and a dwelling with a distinctive shape, which has a round ground shape with a bowl like shallow concavity at center and a pair of small hole (could be holes for pillars) at the side of the concavity, both from earlier period are found in northern Kyushu. 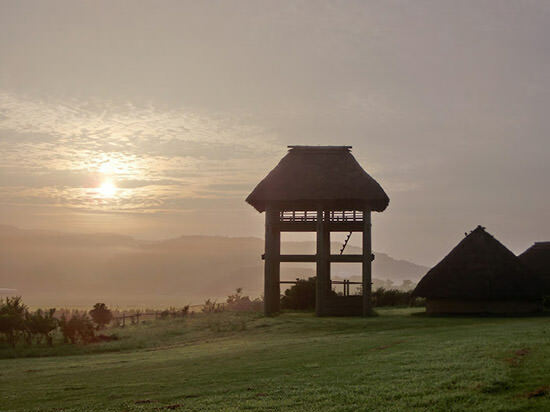 It is assumed that the dwelling (habitation) site from the end to last of Jomon period around western Japan and &apos;Shokikurigata dwelling&apos; became original forms of round plan dwellings that became main stream in the early to middle Yayoi period. In the middle of the Yayoi period, a round plan dwelling excelled in styles of dwelling plans around northern Kyushu to western Japan. A square with round edge type is also found. However, the flat plan suddenly changed to a square or a rectangle around western Japan at the end of the Yayoi period, and gradually standardized to a rectangle. There was a unique type of flat plan dwelling site called &apos;Petal shaped dwelling&apos; distributed in southern Kyushu. Also there is the various regionality in tateanajukyo (a pit dwelling house), such as a round shaped dwelling with special ancient structural remnants called 10 (read; &apos;Ichimaru&apos;) pit at center of its floor, in western Hyogo Prefecture (Harima). 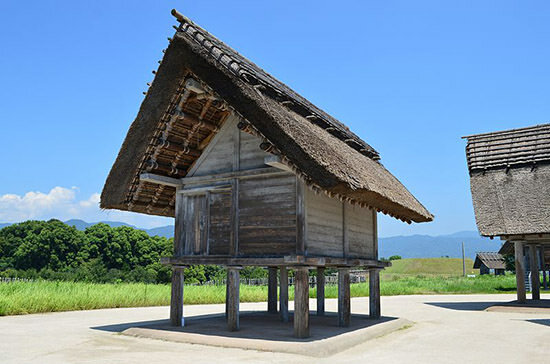 Although the majority of dwellings excavated from the Yayoi period was tateanajukyo (a pit dwelling house), flat-land dwellings and dug-standing pillar buildings are also assumed. However flat-land dwellings loses most of the evidence of living when living surface is scraped and it is very difficult to recognize it as a dwelling therefore very few clear examples of flat-land dwellings have been discovered. Also it is difficult to distinguish dug-standing pillar building and other warehouses mentioned later only from flat plans so, there are no clear examples of dwellings. Warehouse for storage, especially for rice developed in the Yayoi period. Dug-standing pillar buildings were introduced from the Korean Peninsula to a few settlements in northern Kyushu during the earlier period. However the underground warehouse became mainstream by the early period and dug-standing pillar building almost disappeared. Dug-standing pillar building warehouses spread around western Japan between the first half to the middle period. The structure commonly had size of hashirama (bay, space or distance between two pillars) of 1 ken (unit of distance between two pillars) x 2 ken, and some had different variations such as 1 ken x 1 ken or 1 ken x 3 ken. This warehouse style continues throughout the Yayoi period without much change. Around the end of the Yayoi period to the beginning of the Kofun period (tumulus period), Sobashira-shiki building (dug-standing pillar building with a pillar per ken (unit of distance between two pillars), grid type structure) with size of 2 ken x 2 ken emerged, and this became the main structure of a warehouse. There are two classifications in terminology used in the burial system of the Yayoi period, which are; terms describing outside facility of burial facility (upper structure) such as shisekibo (a dolmen), funkyubo (grave mound or tumulus) and shukobo (burial mound surrounded by a moat), and terms describing individual shapes of actual burial facility (lower structure) such as kamekanbo (earthenware jar-coffin grave), dokobo (hole-shaped grave), mokkanbo (wooden coffin grave) and sekkanbo (stone coffin grave). All were formed with elements passed down from the Jomon culture and elements brought from the Korean Peninsula, and there were various characteristics of grave components in each region. Kamekanbo was based on the manners and customs of maiyo (custom of burial during the Jomon period, dead body, etc. was placed inside a pot and buried) in the end to last Jomon period, and was completed by adapting a jar-shaped vessel from the Korean Peninsula as a container for burial. It was the typical burial system in the early to middle Yayoi period in northern Kyushu. Simply an enlarged jar-shaped vessel was used for a container for burial during the first half of the early Yayoi period. However earthenware with its original shape, especially as a burial container, came into being by the end of early period and the shape shifted to maiyou earthenware from a jar-shaped vessel. In the middle period, the earthenware slightly changed its shape, but a large kamekan (earthenware jar-coffin) for adult, which had the same basic characters as previous earthware, was established in northern Kyushu. Then standard sized kamegata earthenware, used as a daily container, started to be used as a burial container for children and infants; the kamekan (earthenware jar-coffin) burial system came to be established. At the same time, a pot type earthenware emerged as a lid of a large kamekan for an adult. Kamekanbo (earthenware jar-coffin grave) were generally structured with two large kamekan for adults with both rims put together to seal. In addition, a pot type earthenware dedicated to a kamekan lid was often used, as well as wooden or stone lid. The kamekan burial system quickly declined in the end period and was replaced by hole-shaped grave with stone lid and hakoshiki-sekkanbo (box-shaped stone coffin grave). Apart from the Itoshima region where the custom barely remained, it was sporadically seen in a former kamekan burial system distribution range and finally the custom disappeared by the Kofun period. The Main distribution range was northern Kyushu, especially Chikuzen, Chikugo Provinces and the eastern Hizen region, and the custom was distributed as a secondary burial system in the surrounding area. Although it is clear the place of origin for mokkanbo (wooden coffin grave) is not yet known, it is a burial system not found in the Jomon culture therefore it is considered as a burial system introduced from the Korean Peninsula. Majority of mokkanbo was called kumiaishiki (unit style), which were generally made by combining six boards, a bottom board, two side boards, two end boards, and a lid board, and the coffin was placed inside a dug out hole. Stones often replaced end boards. There were two different ways of combining the boards, which are two sideboards holding two end boards in between, or two end boards holding two sideboards in between. There is a theory stating that the difference shows buried person&apos;s birth group, but it is not proven yet. Mokkanbo was widespread in the western Japan region (except in northern Kyushu) as the main burial system until the end of the early Yayoi period. Especially in Kinai, mokkanbo and hole-shaped graves were adapted as a core of hokei shukobo (burial mound surrounded by square moat) in middle period. Mokkanbo also declined and was replaced by a hole-shaped grave with a stone lid and hakoshiki-sekkanbo (box-shaped stone coffin grave) at the end of the Yayoi period. Unique mokkanbo with the shape of two hollowed out logs put together at the rims were confirmed specially in the earlier period to the first half of the early Yayoi period. Hole-shaped grave, especially an excavation without shoring, was a common burial system in the Jomon period and also often seen in the Yayoi period. Amity with China goes back to Yayoi men who were immigrants to ancient Japan. Recent progress in DNA research unraveled that many Yayoi men who were immigrants to ancient Japan came from the basin of the Yangtze River and an area around Shandong Province on the Chinese continent. Some research results show that it is possible to go back further to areas around the present Qinghai Province in China. As for rice cultivation, DNA (SSR polymorphism) analysis of Yayoi rice confirmed a paddy-rice variety that does not exist on the Korean Peninsula, and theory of a direct introduction route from central and south China is proposed, not a route through the Korean Peninsula. Also a relationship between genes from a person who cannot drink much alcohol and DNA of a Yayoi man who was an immigrant to ancient Japan has been researched in recent years. There used to be a theory that related the beginning of the Yayoi period with disturbance of the Spring and Autumn periods and the Warring States period in China. However, in connection with a theory to moving up the beginning date of the Yayoi period, whether or not to reject the previous theory, or to relate a new date with political changes of the Yin Dynasty to the Zhou Dynasty has been considered. According to Chinese history books, "Ronko" (Lunheng) written in The Later Han Dynasty provides knowledge about Wa in the Zhou period, and historical records of the Han Dynasty explains about Wa in the age of the former Han dynasty, such as; people of Wa were living in many separated provinces and they sent an envoy. "History of the Later Han Dynasty" (the period of the Northern and Southern Dynasties, established in 432) describes that Wano Nano Kokuo (the King of Japan) received Kanno Wano Nano Kokuo Kinin (the Golden Seal of the King of Japan, Chinese Colony) from Kobu-tei (Emperor Guangwu) of The Later Han Dynasty in 57. Also Suisho the King of Wa (倭国王帥升) (also written as 倭面土國王帥升) sent seiko (slave) to The Later Han Dynasty in 107. "Gishiwajinden" (literally, an &apos;Account of the Wa&apos; in "The History of the Wei Dynasty") from Sangokushi (Annals of the Three Kingdoms) describes state of Wakoku in the third century in detail that Queen Himiko ruled over the Yamatai-Koku kingdom. Although there is no evidence of an official negotiation between Wakoku and Wu in the Three Kingdoms period, two Gabuntai Shinjukyo Mirror (Mirror with figures of duties and sacred animals) with the name of the era in Wu exists as a relic. One was excavated from Toriibarakitsunezuka Tumulus in Ichikawa Misatocho (former Mitamacho), Nishiyatsushiro district, Yamanashi Prefecture and it has an inscription about counting years of Sekiu Gannen (year 1) Year (in 238). Another was excavated from Akura Tumulus in Takarazuka City, Hyogo Prefecture and it has an inscription about counting years of year seven in Sekiu (in 244). Compared to Jomon man, characteristics of Yayoi man were; a slightly elongated face with a flat orbital cavity at nose, and have flat and undefined features. Their average height was 162 cm to 163 cm, which was several centimeters taller. These features are close to Japanese people in the modern age. However, most of these human bone materials were excavated from sites in the coastal areas of the Sea of Japan, including northern Kyushu, Yamaguchi, and Shimane Prefectures. Recently a human bone was excavated from shisekibo (a dolmen), which is a continental burial system, in Shinmachi site in Itoshima Peninsula, Fukuoka Prefecture, and tooth extraction had been performed to the human bone, that was the manner and custom of Jomon. Many of Jomon like human bones were excavated from a group of shisekibo at the Otomo site in Nagasaki Prefecture. Moreover, human bones excavated from the Shinpo site located in Kobe City in the Setouchi region also showed some Jomon characteristics. However, earlier period Yayoi men excavated from the Sasai site in Fukuoka City and the Karako-Kagi site in the Nara Basin were confirmed as bones of immigrants to ancient Japan. In other words, the number of excavated human bones confirmed as immigrants to ancient Japan are very rare in sites from the early Yayoi period, even in northern Kyushu where it is said immigrants to ancient Japan first entered, and in the Setouchi and Kinki region where it is believed continental immigrants to ancient Japan migrated. Jomon man may have started rice-paddy cultivation in area of advanced rice-paddy cultivation, not the immigrants to ancient Japan. It is believed that history moved to an agrarian society in cooperation between Jomon man of an absolute majority and few continental immigrants to ancient Japan.